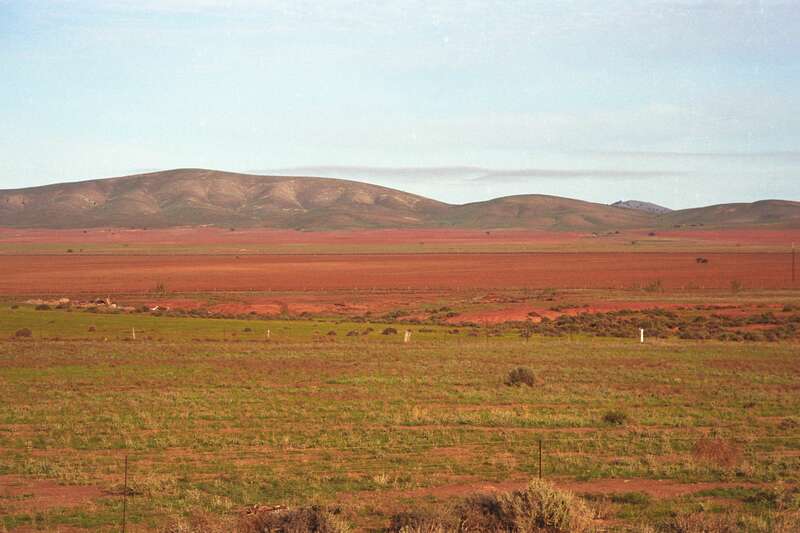 In my review earlier this week I mentioned that Willa Cather‘s description of pioneer life in My Ántonia could apply pretty closely to Australia, but I didn’t say that her description of the landscape could too. Again, the details are different, but the sense is the same. The expansive blue skies and the preponderance of yellows and reds in a vast landscape are all very familiar to Australians. The book is full of gorgeous descriptions featuring the sun and sky, and with the colours of red, rosy, and yellow dominating. I wanted to walk straight on through the red grass and over the edge of the world, which could not be very far away. The light air about me told me that the world ended here: only the ground and sun and sky were left, and if one went a little farther there would be only sun and sky, and one would float off into them, like the tawny hawks which sailed over our heads making slow shadows on the grass. Out there I felt at home again. Overhead the sky was that indescribable blue of autumn; bright and shadowless, hard as enamel. To the south I could see the dun-shaded river bluffs that used to look so big to me, and all about stretched drying cornfields, of the pale-gold colour, I remembered so well. Russian thistles were blowing across the uplands and piling against the wire fences like barricades. Along the cattle-paths the plumes of goldenrod were already fading into sun-warmed velvet, grey with gold threads in it. If I think wheat instead of corn, and spinifex and wattles instead of Russian thistles and goldenrod, I could be reading about Australia. Not that I need to apply my reading to Australia, of course, but in this particular book it struck me again what similarities there are between the two New Worlds of Australia and America. For both our countries, Jim’s description that “there was nothing but land: not a country at all, but the material out of which countries are made” rings true. Yes. I agree with you about the landscapes. Cather is very good at writing about them. Part of the attraction of reading Australian books for me is the sense of the land and sky and space they often convey. I remember your saying that you had visited the Texas Big Bend region where I live and liked the space, how it was like Australia. But I like exploring the differences, too. Couldn’t have said it better myself, mdbrady … there’s always the “ah” moment when you read something that speaks to your own experience, and the “oh” moment when you meet something new and interesting or challenging. Both make reading worthwhile don’t they? I’m re-reading Cather’s novels this year and participating in the Australian Women Writers Challenge (although only one down so far, but my ‘to read’ list is growing!) so it’s a thrill to come across Cather “in” Australia! Is there a novel that you recommend by an Australian women writer about Australia that’s similar to My Antonia? Oh thanks Chris for commenting and so glad you are taking part in the challenge, but you’ve posed a very hard question. I can’t think of any that are quite like My Antonia in the sense of nostalgia for and romance of the past, but probably a good one about pioneer life in Australia is Katharine Susannah Prichard’s The pioneers. It is set in the Victorian bush, not in the vaster outback, and she has a philosophy she wants to promote, but I think you would like it if you like My Antonia. Miles Franklin’s My brilliant career is a turn of the century novel set in the outback and is about her wish to escape the country for a life of writing in the city. It’s nothing really like My Antonia though! It’s interesting but most of the Australian women writers I can think of who wrote in or about the late nineteenth and early twentieth centuries (say, 1890s to 1930s) wrote more about city life. Some of them would probably remind me more of Wharton than of Cather. Certainly Cather captures the similarity of settlement in the USA and Australia, but maybe there are few Australian women’s accounts because the experience there was also different. Cather is one of many women who write nostalgically and romantically about pioneer life on the American Great Plains, sweeping from Kansas to Canada and settled after most danger from Indian attacks was over. Most of the land was farmed by families on land homesteaded from the government with little “hired help.” The only ethnic difference was a sprinkling of Czech and Norwegian families. Such farms are iconic in American culture. They were not like the stations I have read about in Australia, except occasionally on the big ranches of west Texas. I am no expert on Australian history and lit. I had never read an Australian book before I stumbled onto the Australian Women Writers Challenge, but then I got hooked. I have been reading about and finding some of the 1850-1920 women writers available online through Gutenburg. Sue is right that some do write about life in the cities. Those who do write about rural life seem to be critical about what it meant for women. Anything but nostalgic. The bush and the culture of “mates” seems very masculine. I’d welcome some suggestions for further reading about this idea. Cather’s choice to tell My Antonia from a man’s point of view is fascinating to me. O Pioneers and Lost Lady are similar to it and Song of the Lark is about a young woman who loves the land but leaves to get training for her musical talents. That’s exactly right Chris … there’s not the nostalgia that we see in Cather AND the male voice – the way it is used – makes it pretty unique. And yes, the criticism about what it means for women is what made me think Wharton more than Cather not that Cather makes it look easy for women but it’s not her main focus (here anyhow). I think you’d like the book … G’ma Sydney has a copy of it as I recollect. I think I gave it to her and it’s her copy that I read first. Well look at that! The photo could definitely be America. So alike but different too. It is interesting to compare the landscapes and pioneer experiences between the two countries. Yes, Song of the Lark is more of an attempt to deal with a woman’s viewpoint, but she leaves the praire for Wharton’s world. This is Marilyn, not Chris. And are there any Australian women’s historians looking at these issues? Sorry, Marilyn (I’ll call you that now). I knew I was responding to mdbrady but the hands and the brain got disconnected. That’s a good question. Do you mean looking at women’s lives in colonial and early twentieth century times? I’m not a big history expert so my reading is sporadic. I did write a post a little while ago in which I mentioned an historian Katie Holmes and an anthropologist Diane Bell who have written about women’s lives (https://whisperinggums.wordpress.com/2012/03/08/some-books-that-raised-my-consciousness-thoughts-of-a-reader-on-international-womens-day/) I think Katie Holmes is still working in this area. Anne Curthoys was working in areas of women’s issues but I think she has moved more into race and indigenous issues now. Jill Matthews is another who writes on gender. I’ve read some work by Maryanne Dever but she’s probably more into cultural studies than history — she has looked at women writers, women and culture in the first few decade of the 20th century. But I’m not sure who would be regarded as the leaders in this area at present. Thanks. Those were the kinds of leads I wanted. I have already followed your suggestions and found the books by Holmes and Bell. I loved Spaces in her Day. Oh thanks Marilyn. So glad you liked Spaces. It’s a wonderful and moving read isn’t it? Makes me realise how lucky I am … Though not enough to be complacent! One Australian women writer that maybe of interest about pioneer life in Australia, is Mary Durak. Her book, Kings in Grass Castles, is about her pastoral family. Ruth Park and Dymphma Cusak also come to mind when thinking of Australian women authors. Both write about the hardships of Australian women not only in the cultural sense, but also as mothers, daughters and girlfriends. Thanks Meg … they are great options too. I was trying to closely – but unsuccessfully – find works close to My Antonia but found it pretty impossible which rather confirms what a unique work it is. Park is great on women’s urban experience … I must say I haven’t read Kings in grass castles though it’s one of my father’s favourite books. He’s read it multiple times and has just reread it in the last month or so. I should read it now as we are going to Kununurra next month. For Marilyn’s benefit I should explain that it’s memoir/autobiography/biography rather than fiction but is regarded as an Australian classic. I still haven’t read Dymhna Cusack though have a book of hers on my TBR now and am trying to get to it! What about “We of the Never Never” by Mrs Aeneas Gunn; “All the Rivers Run” by Nancy Cato and my favourite of all stories about woman settlers – “Labourers in the Vineyard” by Colin Thiele which while written by a man is one of the most poignant and sympathetic and at times harrowing account of the life of a female Barossa German settler who gets off the boat in Adelaide, poor and illiterate and walks to her future life of toil, etc in the strict Lutheran world of the 19thC Barossa Valley. Thanks for these Jude … I love how these sorts of posts and questions bring up new titles and ideas. I have to admit that I haven’t read the Cato, and I haven’t heard of the Thiele. That sounds really interesting and Thiele certainly has an ability to describe land and place (as I recollect). These are probably more in the historical fiction mould than My Antonia which is written roughly around the time it is set, but they’re good suggestions re the pioneer experience. Thanks you all for suggestions. Now I’ll see what ones I can find here in the USA. Great Marilyn … and if you read any, let us know what you think.